SpaceX's Flight: Will Space Tourism Take Off? Let's be honest: for all of NASA's Apollo-driven glory, the 30 years of bloated-budget, earth-tethered Shuttle missions has left everyone with the niggling feeling that somebody else could probably do this space thing better. Early Tuesday, somebody stepped forward. Gathering in Hawthorne, Calif., within binocular's view of the Los Angeles suburbs that once served as the nation's aerospace hub, more than 1,000 employees of Space Exploration Technologies Corporation (Space X) erupted in cheers as they watched live video of a 157-foot tall Falcon 9 rocket heave an unmanned Dragon capsule into space. Elon Musk, the company's 40-year-old billionaire founder and chief executive, told reporters that "every bit of adrenaline in my body released" while watching the glistening white projectile clear the launch pad. "There's so much hope riding on that rocket." Some of that hope comes from none other than NASA, which is in the peculiar position of rooting for another party's rocket. The agency awarded Space X $400 million in seed money, hoping to someday save the $63 million it will have to pay the Russians each time they want to send an astronaut to the Space Station. If the current mission is successful, Space X will soon begin fulfilling a $1.6 billion NASA contract for 12 Space Station cargo flights. Though Musk made a point of emphasizing his integral partnership with NASA, there's no mistaking the impression that the once vaunted space agency has just been leapfrogged by a younger, more energized competitor. Musk, who founded PayPal, compares the mission to the Internet of the 1990s, when commercial companies entered what was originally a government endeavor. "I believe that this mission will be historic in marking that turning point toward a rapid advancement in space transportation technology," he said following the launch. Part of the "significant commercial space element" that Musk embraces includes space tourism. The Dragon capsule is designed to hold seven astronauts; Space X is betting that not all of its passengers in the future will work for NASA. At the moment, Musk's elaborate vision hinges on how Dragon performs during its two-week trial run. If all goes as planned, the capsule will spend Tuesday playing a 17,000-m.p.h. game of catch-up with the International Space Station. System checks follow on Wednesday, as the capsule navigates to within 1.5 miles of the station during a series of tests to demonstrate communication and maneuvering capabilities. If NASA gives the go-ahead, the Dragon will draw within 33 feet of the station on Friday, and the station crew will use a robotic arm to grab and dock it. On this mission, unlike future assignments, the payload is a secondary concern. The capsule is filled with a relatively meager 1,014 lb. of supplies for the station's inhabitants, including food and several student experiments that will examine how microgravity affects spiders, fermentation and antibiotic resistance. One payload has already been delivered to space: the second, expended stage of the Falcon 9 contained the cremated remains of 300 people into orbit. That's right, Star Trek fans, James Doohan's ashes have reached the final frontier, as have those of Gordon Cooper, one of the original Mercury astronauts. The remains will orbit for about a year until burning up in Earth's atmosphere. Dragon is scheduled to make a less fiery return trip with an Apollo-style splashdown in the Pacific Ocean on May 31. The splashdown will mark another milestone, since European, Japanese and Russian cargo vehicles do not return from space; they simply orbit until incinerating in Earth's atmosphere. Space X hopes to demonstrate that it can successfully return a spacecraft, something only manned missions backed by large governments have accomplished thus far. 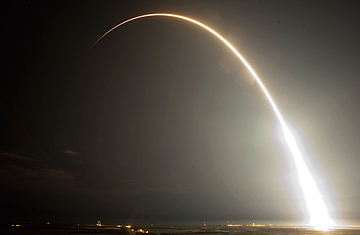 Equally splashy is the effect the Falcon 9's launch may have on space economics. Transporting gear to the space station rather famously cost $10,000 per pound using the Space Shuttle, a figure Space X estimates it can do for less than $3,000 per pound. Analysts say that's generally cheaper than some competitors  but those competitors include United Launch Alliance, a joint venture between Boeing and Lockheed Martin that effectively brings 50 years of launch experience to the business. If Space X can demonstrate reliability in addition to its relatively low per-pound costs, the company stands a good chance of gaining a long-term foothold in a multibillion-dollar industry. For shuttling humans, Space X faces competition from companies such as Virgin Galactic, which hopes to operate privately built spaceships modeled after the ballyhooed SpaceShipOne. Again, however, the company that wins public approval will be the one that can demonstrate both reliability and cost. Naming a rocket after the Millennium Falcon is cute, but to secure market share Space X will need to prove that its version of the fictional starship is as durable in the clutch. This month's mission, if successful, will be the first step in doing just that. That's why NASA administrator Charles Bolden proclaimed the Falcon's launch "the beginning of a new era in space exploration." While it seems like NASA says the same thing every couple of years, the fact remains that Dragon is poised to become the first private spacecraft to dock with the Space Station. The company's 12 subsequent cargo missions will not only allow NASA to focus on deep space  a goal many of NASA's astronauts have publicly advocated for years  but will also serve as crucial flight experience for Space X, which hopes to begin ferrying astronauts as early as 2015. We already know that such experience will not come without hitches. There was one this week when Space X had to abort a liftoff three days before Tuesday's launch. But another Falcon 9 rocket is already in a Cape Canaveral hangar undergoing final tests, and a second Dragon capsule is close to completion in Hawthorne. How far they fly, and how often, will depend on how well Space X can overcome the inevitable complications facing anyone  private or public  heading into space.